August 2015 – ADVOCATES FOR FINE ART ENAMELING INC.
Mary and I had the pleasure of meeting Gabrielle and her husband and child at the Enamel Society Conference in Beverly Massachusetts in August of 2015. Gabrielle won a prize for her wall piece, Clair de jour (8″ x 8″). 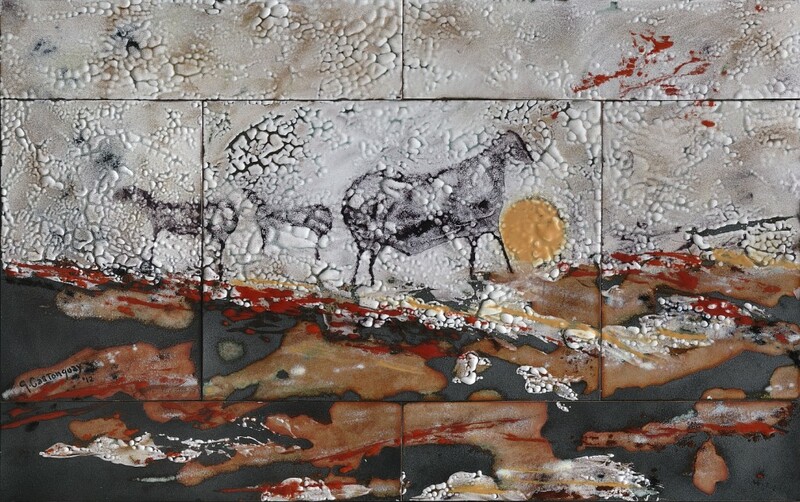 This enamel was the “First Prize Winner” for wall art. This enamel reminds me of the kind of enamels which were the mode at the first Enamelist Society conferences. It is also more representative of enameling now being done in Europe than in the United States. For these reasons, I will call it a classical enamel. 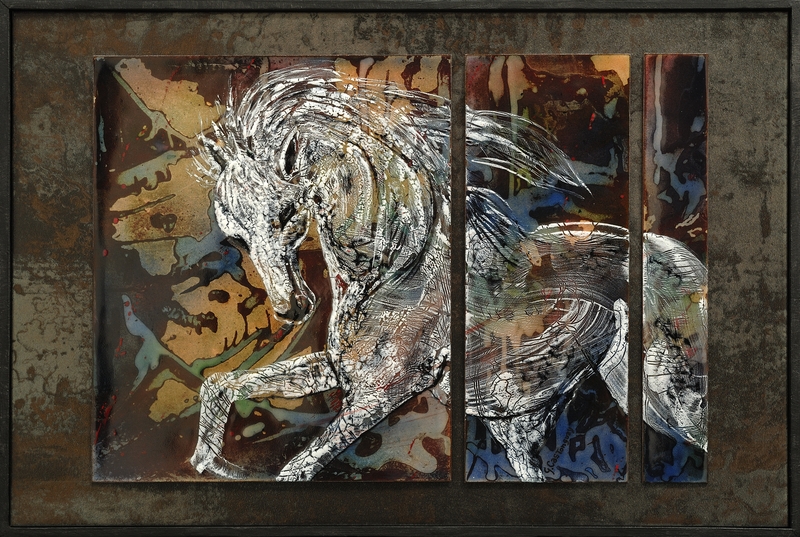 It is a stunning figurative and pictorial enamel; it is designed to stimulate emotion and thought in the viewer. Three people are walking along a street which may be wet. We have a view of their backs. They are in shadow. 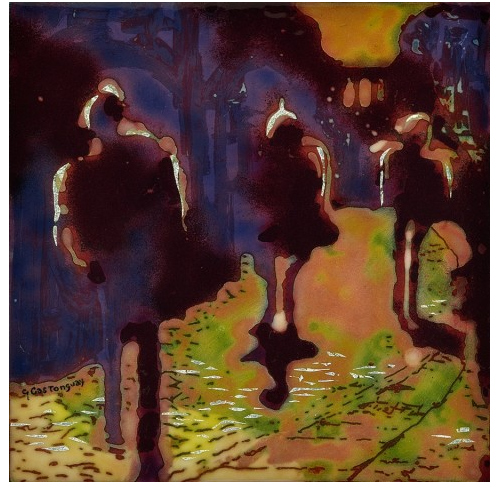 The colors of the figures and of the dark buildings to their left seem to change as one views the image and when one changes position. Clair de jour seems to be flat, but as the viewer moves closer to the enamel, slight rises in the underlying copper have a surprising effect. The figures depicted seem to rise and fall and change shape. The background also changes shape ever so slightly. This is an effect that is new to me, and I am quite impressed by it. It added considerably to the air of mystery which this enamel created. Where are these people? It could be anywhere in the world. When is this happening? Where are they going? The end of there street seems to be crossed by a Roman aqueduct? A grand monument? A religious building? What? They seem to be sauntering along, perhaps wandering. We have only their shadow figures and their postures to tell us anything about them. The title doesn’t help me clarify the mysteries. 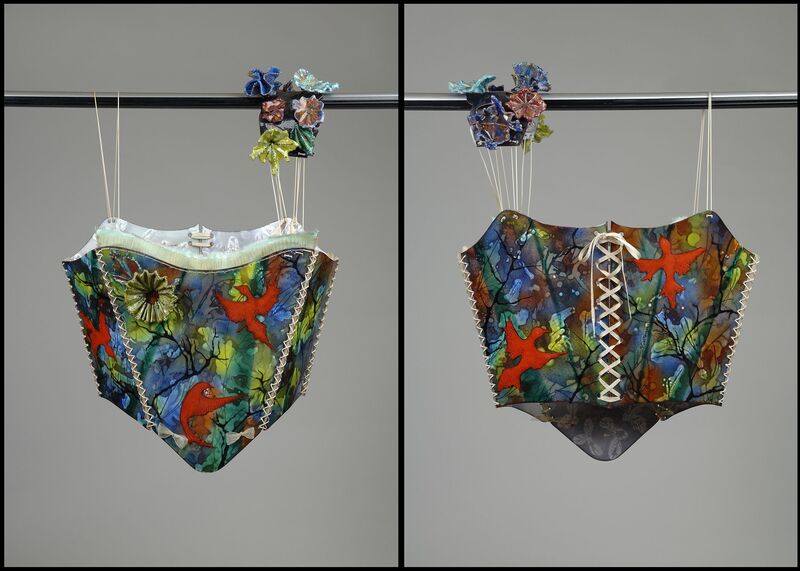 Here’s something different from Gabrielle Castonguay: a multimedia wearable corset . The metal work consists of enameled copper and electroformed copper. In addition, the piece contains various fabrics. The dimensions are 22″h x 11″w and 9 1/2″d. The title is Corset-La Lac. 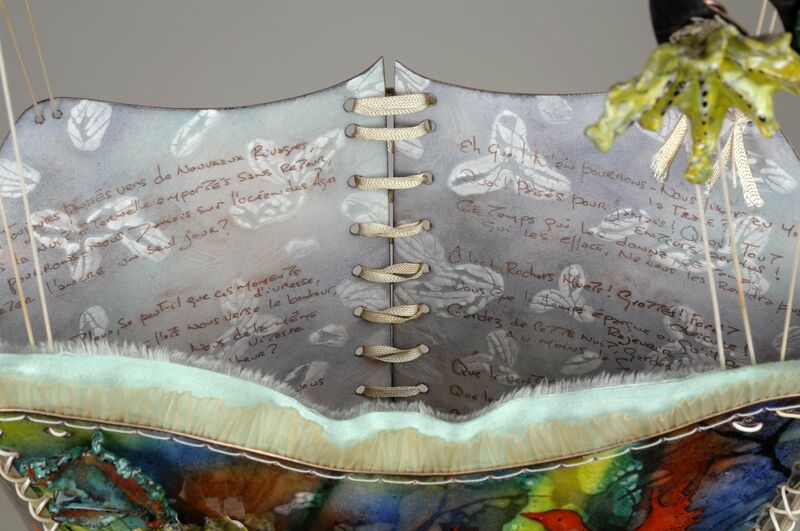 The corset was created to reflect the tone and meaning of the poem La Lac, by Alphonse de Lamartine. Here is a very imposing image of a romping horse.